People call us from all over for these Vermont-made classic old-fashioned snacking and soup crackers. 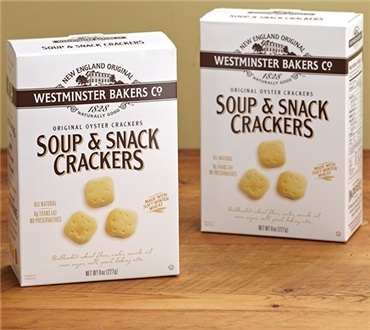 Baked in Vermont using the original 1828 recipe - Westminster Crackers are all natural, have no preservatives and are trans fat free. You really can taste the goodness in every bite. They come to you freshly made, firm and flaky. We think you will agree with so many of our customers from coast to coast that they are the best crackers you have ever tasted! Try the NEW all natural rounds! Delicious baked round crackers perfect for snacking and entertaining. We have purchasing Westminster crackers for many years. These are enjoyed in my home as a snack or in delicious homemade soups. I have enjoyed these since a 2001 trip to Oregon when I discovered them when I ordered Clam Chowder at a great restaurant in Portland. Fell in love years ago with Westminster Oyster Crackers and buy them when I see them. Now I have a source with Dakin Farm. Their service and packaging were excellent! The best cracker we have ever found. Always fresh!